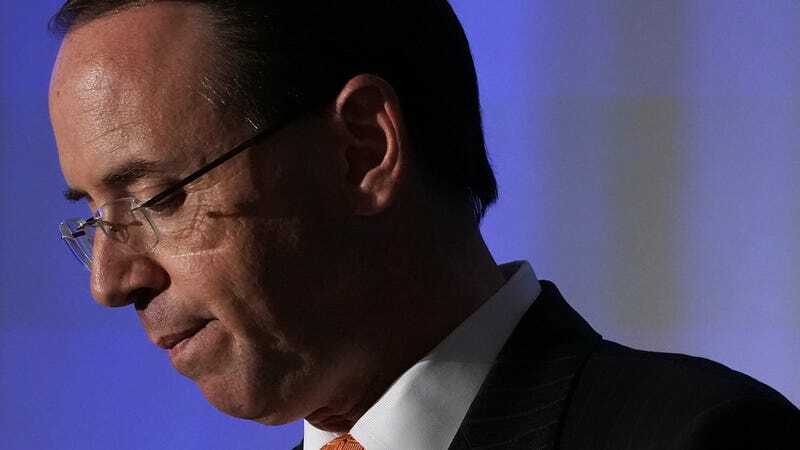 U.S. Deputy Attorney General Rod Rosenstein pauses as he speaks during an event on October 17, 2018 in Washington, DC. A woman employed by a close alley to Russian President Vladimir Putin has been charged by U.S. prosecutors with conspiracy to interfere with the upcoming midterm elections. The accused, Elena A. Khusyaynova of St. Petersburg, is said to be the chief accountant of “Project Lakhta,” a Russian propaganda effort whose stated mission in the United States is to “spread distrust toward candidates for political office and the political system in general,” according to a criminal complaint unsealed Friday by a U.S. District Court in Virginia. Prigozhin was himself indicted by the Justice Department in February, accused by the special counsel’s office of funding the Internet Research Agency, a St. Petersburg-based troll farm that U.S. intelligence officials say spread divisive propaganda to millions of American voters during the 2016 election—primarily with Facebook. According to the FBI, the Internet Research Agency is but one of several organizations that operated covertly under Project Lakhta’s umbrella. The Russians developed strategies that allowed them to “target audiences with conservative or liberal viewpoints, as well as particular social groups,” the complaint says, such as carefully choosing which news articles to circulate among which groups. “[I]f you write posts in a conservative group, do not use Washington Post or BuzzFeed’s titles,” one of the conspirators allegedly wrote. The group also sought to smear Special Counsel Robert Mueller, who is investigating Russia’s interference in the 2016 election, and whether anyone associated with the Trump campaign was wittingly involved. Project Lakhta’s playbook apparently advised members to paint Mueller as “a puppet of the establishment” and list off scandals that occurred during his time as FBI director. In a statement, the Justice Department said the charges against Khusyaynova do not in any way allege Project Lakhta altered the outcome of the 2016 election. Nor does it suggest any American knowingly participated. U.S. Attorney Zachary Terwilliger of the Eastern District of Virginia, where the case is being heard, said the conspiracy “continues to this day” with the goal of undermining faith in democratic institutions. “This case demonstrates that federal law enforcement authorities will work aggressively to investigate and prosecute the perpetrators of unlawful foreign influence activities, and that we will not stand by idly while foreign actors obstruct the lawful functions of our government,” he said.